There are two things that impact new item performance. You are not developing enough new items to replace dying items. The items you are developing do not perform as well as new items used to perform. Go get your hands on some merchandising data. Count, by season, the number of new items offered, for the past five or six years. You'll quickly observe how much focus your merchandising team gave new items. Next, analyze the performance of new items, by season. What do you see? Measure sales per item, and compare it across years ... if you are a cataloger, add thousand pages circulated (circ * square inches) to the analysis, if you're an email marketer, add a measure of how often new items were "featured" in each year. You're going to quickly identify your problem when you run this report. After looking at simple metrics like new customers and performance by segment (evaluating performance at a 10 foot level), you need to step back, and evaluate performance at a 10,000 foot level. 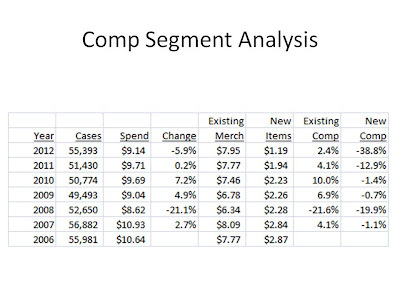 I always start with what I call a "comp segment analysis". You've heard me say this several times, but I am surprised that I've yet to see one person perform this analysis in my travels over the past five years ... not one single person mentioning it on Twitter, not one person in the blogosphere, or at any conference I've been to ... not one. I like to look at customers who purchased exactly two times last year ... in some cases, I'll add a 0-3 month recency filter to the query, but overall, I like to look at customers who purchased exactly 2 times last year. Say we're looking at the month of February. I will freeze the file as of 1/31, and identify all customers with exactly two purchases in the year prior to 1/31. Then, I simply calculate the average amount each customer spent from 2/1 - 2/28. It's not a difficult analysis. It is a revealing analysis. In this case, comp segment performance is down by about 6%, so that's not good. 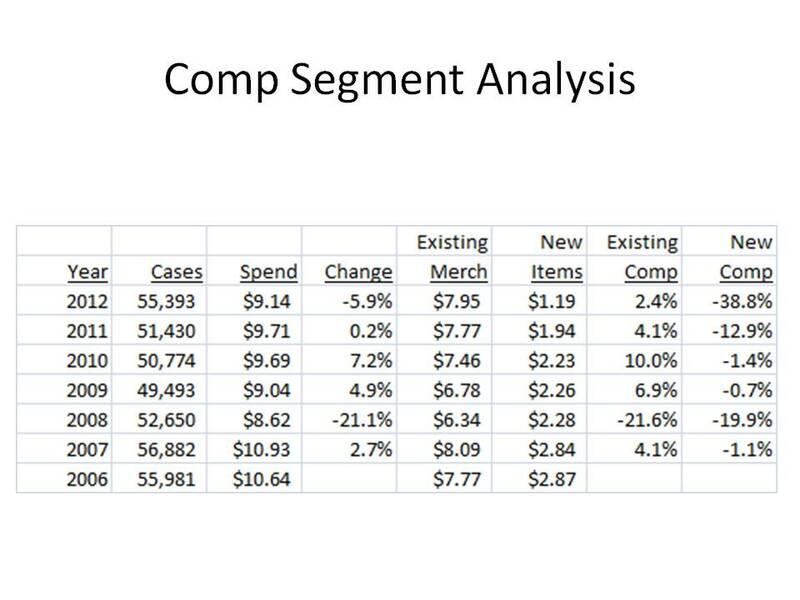 However, look at the "Existing Comp" and "New Comp" columns. Existing items are performing reasonably well, heck, they're even outperforming last year. In this example, new items are the problem ... performance is bad, very, very bad, and has gotten worse each of the past six years. Have you done this analysis? Like I said, I've yet to run across anybody who does this. In this case, the marketer pinpoints the problem with performance. It isn't landing pages. It isn't offers in email campaigns. It isn't long-tail search performance. It isn't channel shift. It is a merchandising issue, one being driven by an inability to either create new items, or one being driven by terrible performance among new items. Run the analysis. Let us know what you learn. If you don't have the resources to run this analysis, give me a holler, I'll do it for you. Maybe this has happened to you before. It's July, and business is off by 10%, it had been on plan all year. So you ask your team the following question ... "what happened, and how do we fix the problem?" This is where the finger pointing begins. Your catalog expert tells you that housefile is off by 6% and prospect lists are off by 16% and that he thinks that the creative was awful and the price points featured on pages two and three were too expensive. He tells you that he's going to call the co-op representative and he'll yell at her to provide "better names". Your online expert tells you that conversion rates were down 5% and traffic was down 5%. She thinks that Google has made huge changes that are hurting your business, that you're struggling with long-tail keywords, and that email didn't have a strong enough promotional message. Your creative leader thinks that marketing did a poor job of targeting the audience for the catalog, and that the merchandise is too old and stale. Your merchant leader thinks that marketing did a poor job of targeting the audience, she thinks the creative was awful, and she thinks the merchandise was appropriate and consistent with prior years. Your call center leader noticed on Twitter that six customers complained that they didn't receive a catalog, so it has to be the USPS that screwed up, because Facebook likes increased from 1,223 to 1,493 in July. Times have changed. There are 88 moving pieces these days, maybe 1,088 moving pieces. You need more "proof", and fewer "opinions". It's hard to get the proof, isn't it? So a starting point is to ask your staff to prove their opinions. When they don't have the data they need to answer your question, they offer you a credible opinion. Ask them to see the data that validates their opinion. Odds are that your team doesn't have the data to validate the opinion. But this represents an important, teachable moment. If the merchandising/creative team thinks that marketing targeted the wrong customers for an email campaign, have them prove the hypothesis. If marketing thinks that price points are too high, have them prove that high price points consistently lead to sub-optimal business performance. If the call center leader thinks that Facebook "likes" increased, then have the call center leader prove that "likes" lead to sales increases. Too often, I don't see this from Leadership. Too often, we cobble together the opinions that make the most sense, assign some blame, and move on to the next topic. Start asking your team to validate their opinions with actual data. And if they don't have the data needed to validate an opinion, have them call me!! Your Catalog PhD Project: Now Fortified with Judy, Jennifer and Jasmine! 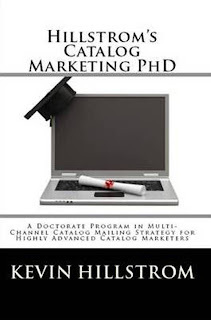 Catalog PhD projects have resulted in more than $24,000,000 in annual profit improvement for my client base. Now, you get an added bonus. In each Catalog PhD project you hire me to conduct for you, you also get Judy, Jennifer, and Jasmine (male names are fine if you have a business model requiring that) as part of your project work, for free! If you're interested in your own Catalog PhD project, take a look at the booklet for starters ... maybe you can execute the project yourself. If you can execute the project yourself, that's fantastic. If you need help, give me a holler ... click here to contact me about your own, customized Catalog PhD project. For those who have a retail channel, you don't have much data to tell you if Judy, Jennifer, or Jasmine are shopping retail stores. You do, however, have data that tells you which direct-channel customers are shopping your stores. So, segment your direct-channel customer base ... I like to look at 12-month buyers, but include all purchase history, weighted by recency of course. Once I have everybody coded (Judy, Jennifer, Jasmine), I split this audience by direct-channel only and retail+direct-channel. This is a very common outcome when a retail brand elects to "integrate" the direct channel with the rest of the business. It's common to have more "Judy" style customers in the direct-only side of the business, these are often rural shoppers without access to retail. In this situation, Management can elect to better "integrate" channels. Or, Management can realize that different customers are shopping for different reasons, and capitalize on this opportunity. If you are trying hard to align channels, then your efforts will bear fruit when the composition of Judy, Jennifer and Jasmine are similar for direct-only and direct+retail customers. "We really think the iPad is the future of cataloging, and yet, so few people truly use our app. How do we get customers to use this thing?" Here's the problem, folks. We keep trying to encourage our "core audience" to do new and interesting things. They don't want to do new and interesting things. I've been talking about "Judy", "Jennifer", and "Jasmine" for weeks. We made a choice, somewhere around 2001, to be "multichannel". That choice sent us down a path that is difficult to reverse, now. Our customer file, thanks to the co-ops, is disproportionately comprised of customers like Judy --- a 55+ rural shopper. Now, be honest with yourself. Put yourself in the head of this 59 year old customer. What problem does your iPad app solve for this customer? How does thumbing through the pages of a catalog on a digital device improve the experience, when this customer already has your catalog in her hand, and has enjoyed shopping that way for thirty years? It's my opinion that Judy is not going to shop on an iPad. If Judy represents more than half of your customer file, well, don't expect big-time iPad app success. Let's move on to Jennifer. She's somewhere around 43 years old, she's a part of the Google generation. She scours the internet for the best deals, your catalog inspires her, but it inspires her to visit Google. So, again, what problem does the iPad app solve for Jennifer? Be honest. This brings us to Jasmine. Think of her as being a 27 year old mobile/social/local customer, one where the iPhone is never out of her hands. This customer may well use your app. Here's the problem, however ... how is she going to find out about your app? You'll advertise your app in your catalog, you may advertise it on your website, you may even talk about it on Facebook or Twitter. But if you are Cuddledown of Maine, for instance, you're using marketing materials tailored to a Judy/Jennifer audience to try to track down Jasmine. The secret, of course, is to be where Jasmine is. As catalogers, we're terrible at this, we know how to be where Judy is. If we want iPad or app or iPhone or Android success, we're going to have to do two important things. Solve a problem that a catalog and/or website can't solve. Be honest, what problem does your app solve that isn't solved by catalogs or e-commerce? We're going to have to develop a marketing plan that gets the app in front of the audience most likely to use it. What is our marketing plan, folks? Ok, you've been hearing about Judy, Jennifer and Jasmine for close to a month. You're going to hear about them more in the future. My web analytics data on each persona reveals your perceptions about each individual. In order, you prefer Jasmine first, then Judy, and Jennifer last. If I put Jennifer in the subject line, you tune out. This is so reflective of what we read in the trade journals and on Twitter, isn't it? We're either told that we have to be "multichannel" ... which is ultimately a way of saying "we need to communicate with Judy", or we have mobile/social/local shoved down our throats like a garden hose hemorrhaging water. The folks who have a passion for Jennifer have a passion for tactics, and for good reason. Marketers speaking to Jennifer use tools like Google Analytics ... and as we all know, this tool doesn't allow us to do true customer-level research, so we never know the customer, we only know sporadic, channel-based facts about Jennifer. Facts like the search terms she uses, the affiliates she snaps up a coupon code from, facts like her love for email marketing that results in 1 in 400 people who receive an email campaign actually buying something that generates profit. When it comes to Jennifer, we only know tactics, we don't know the lady. It's the great weakness of the "Jennifer Generation" of marketers/analysts. Many of you love Judy. I think this is because many of you can relate to her. This is also a weakness ... many of you help run companies that cater to Judy, you are in her cohort, so you understand what motivates her. This deep, thorough understanding limits knowledge of Jennifer, and as a result, has some catalog brands on the verge of falling off of a cliff. Go perform a demographic analysis of your customer base. Is your average customer 59 years old, or 64 years old? If your customer is that old, ask yourself what you're going to do in five years when this customer is now 64-69 years old, or in ten years when your customer is 69-74 years old? I realize that you're hoping that you'll be retired by the time your customer falls off the commerce cliff into retirement, but somebody is going to have to deal with this. Don't put this problem off for five years, why not start trying to relate to Jennifer today? I know, you don't have a passion for Jennifer, for this iPad-toting 43 year old professional who desperately wants to purchase with 20% off and free shipping. You don't have a choice, folks. Get to know Jennifer, start relating to her before it is too late. For many catalogers, we're about to cross over into the realm where it is too late. Your love of Jasmine is more of a curiosity than anything else. You click on all of the links, checking out the businesses I mention ... whereas you don't click on any of Jennifer's links. Here's where things get interesting ... the feedback stops after the links are clicked. In other words, you want to know what Jasmine is doing, you don't necessarily want to take advantage of what Jasmine is doing. You want to know that she likes buying a handbag for $99 on MyHabit instead of paying $399 at Nordstrom ... but you don't care about creating a business model to compete with MyHabit. This is important, folks. I get feedback like "but how do I get Jasmine to buy from my catalog?" or "nobody buys from social commerce" or "we can't sell something below cost" or "this audience isn't big enough to matter." We won't get Jasmine to buy from a catalog. And yes, almost nobody buys from social commerce today, and social commerce as defined today won't be what it will be in five years so why invest today, and I realize you can't sell below cost but maybe other companies have figured out different business models that allow them to cobble together a profit (or not), and yes, the audience isn't big enough to matter today, but it will be big enough to matter in five or ten years ... at the same time when the catalog generation retires. So all of this is interesting, folks. Your clicks, what you choose to look at, what you decide to focus on, dictate what you get from this series. Your clicks suggest that you like Judy, you enjoy reading about Jasmine the most, and suggest that many of you really don't understand or have a passion for Jennifer, fueled by a focus on the tools that you use to analyze Jennifer (i.e. Google Analytics). We end this post with an opportunity for you to share your thoughts ... what do you think of Judy, Jennifer, or Jasmine? What resonates with you, what doesn't make sense whatsoever? Who do you like, who don't you like? What am I right about, what am I off base about? We marketers really mess up the "Jasmine Experience", don't we? Remember, Jasmine is a whole different shopper than we're used to. The economy caused her to have a laser-like focus on price. She's going to buy a handbag, but she'll pay $99 on MyHabit instead of paying $399 on Nordstrom.com. She's going to trust what a friend says over trusting marketing messages. So emails, flash sales, deals, Facebook, and friends comprise her preferred experience. Let's say she buys from Cuddledown of Maine, maybe because a friend told her that the sheets are amazing. All we see, as marketers at Cuddledown of Maine, is that this customer purchased online. So, what do we do? We send her a hotline catalog, after all, this is a "best practice" in catalog marketing, right? We make sure that she receives six or seven catalogs in her first six months as a customer. We push eight promotional email campaigns at her, each month, offering 20% off. We make the mistake of treating Jasmine like Judy, don't we? Not surprisingly, those dollars are largely wasted, causing us to say that some of these online channels "don't work". Maybe, just maybe, we should work hard to identify this customer as "Jasmine" after the first order. We take online data from Omniture or Coremetrics or Webtrends and append it to her customer record. Maybe we ask her for her Twitter ID when she purchases, and then we thank her for her purchase within a day of the order. Maybe we give her content that she can put up on her Pinterest page. I know, you'll say that those are "dumb" ideas. Maybe they are. But how much dumber are they than sending a half-dozen expensive catalogs to a customer that has no interest whatsoever in purchasing via catalogs ever again? We need to segment customers, and start treating customers differently. Judy is the quintessential catalog buyer. Jennifer is a charter member of the online marketing generation. 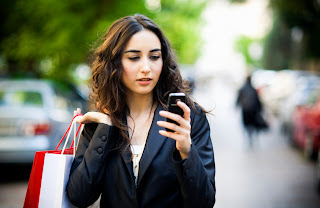 Jasmine is the social commerce shopper who will make the purchasing decisions that fuel the economy from 2020 - 2029. This Jennifer character, she's an interesting one. Let's look at a few example of what Jennifer looks like. And remember, we weight historical transactions by recency ...1.00 for 0-12 month orders, 0.50 for 13-24 month orders, 0.25 for 25-36 month orders, 0.15 for 37-48 month orders, 0.10 for 49-60 month orders, and 0.05 for 61+ month orders. So here's an example. A customer spends $100 60 months ago via telephone, and then spends $100 today via a pure email order. Net Weighted Outcome = ($100 * 0.10 * 0.15 + $100 * 1.00 * 0.70) / ($100 * 0.10 + $100 * 1.00) = 0.65. Judy = 0.000 to 0.333. Jennifer = 0.334 to 0.667. Jasmine = 0.668 to 1.000. In this case, the customer is "Jennifer". Her telephone purchase five years ago holds her back from being a "Jasmine", just barely. As that transaction ages, Jennifer will become Jasmine. Or, if she buys via email again, she'll become a Jasmine. Here's another example: The customer purchased online after receiving a catalog 13-24 months ago, and the customer purchased off of her iPhone yesterday. The catalog-based transaction was $200, the iPhone purchase was $50. Net Weighted Outcome = (200 * 0.50 * 0.30 + 50 * 1.00 * 1.00) / (200 * 0.50 + 50 * 1.00) = 0.533. 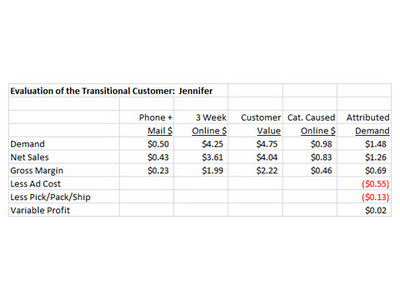 This customer is "Jennifer" because her catalog-based transaction was four times as big as the iPhone transaction. Again, as that catalog-based transaction ages, Jennifer is more likely to become Jasmine, especially if she purchases this way in the future. Better yet, link your web analytics data to purchase data across channels ... account for Jennifer-like referring URLs in your weighting scheme. I know, I know, you're going to have issues with this. Well, you are welcome to do your own research, and come up with your own weighting scheme, I'd welcome it. Heck, if you do it, I'll consider publishing it for all to see! Have you bought flowers yet for your spouse/partner? Here's the thing. Somebody decided to create an "event", and the public complied, to the tune of billions of dollars of chocolates and flowers and jewelry and cards. An EVP recently told me that his brand had "nothing to talk about, the customer has seen it all". Well, if you have nothing to talk about to the customer, why should the customer even care about you? You can build upon an existing event. You can create an event. Or, you can do like Fab.com does ... they have sixteen events each day. Sixteen events every single day! We used to plan our lives around sixteen catalogs per year ... each email campaign indirectly supported catalog mailings. We might have to get used to a future where we have sixteen events a day, each one targeting a different customer segment. Net Weighting of 0.000 to 0.333 = Judy. Net Weighting of 0.334 to 0.667 = Jennifer. Net Weighting of 0.667 to 1.000 = Jasmine. ($100) * (1.00 for 0-12 month orders) * (0.15 for Telephone Orders) / ($100) * (1.00 for 0-12 month orders) = 0.15. Because 0.15 is between 0.000 and 0.333, this customer is a "Judy". ($100 * 0.50 * 0.15 + $100 * 1.00 * 0.30) / ($100 * 0.50 + $100 * 1.00) = 0.250. Because 0.250 is between 0.000 and 0.333, this customer is a "Judy". Get the picture? Good! We'll take a peek at "Calculating Jennifer" next. How Do I Decide Who Is Judy, Jennifer, And Jasmine? There are two key issues to consider, when deciding how to segment Judy, Jennifer, and Jasmine. Issue #1 = Weighting Dollars: A telephone order in 2002 is virtually meaningless. An online order in 2008 has some meaning. A mobile order in 2012 means a lot. I like to use the following weighting of historical orders/dollars (these weights are company-dependent ... more Judy-type customers usually causes the weights to be greater ... more Jasmine-type customers usually yields smaller weights). Orders 0-12 Months Ago = Weight of 1.00. Orders 13-24 Months Ago = Weight of 0.50. Orders 25-36 Months Ago = Weight of 0.25. Orders 37-48 Months Ago = Weight of 0.15. Orders 49-60 Months Ago = Weight of 0.10. Orders 61+ Months Ago = Weight of 0.05. Issue #2 = Weighting Channels: This one, of course, is important. Each advertising channel gets a weight. Now, we can debate the weights until the cows come home, and there isn't a right or wrong answer here, so pick up a broom and do some work. Here's a starting point for some of you ... my weights are client specific, of course. Tablet Orders: Right now, I don't evaluate these different than online orders, we need proof that these orders lead to different subsequent behavior, different than classic e-commerce. Tomorrow, I'll show you a series of examples of how to calculate Judy, Jennifer, and Jasmine. Many of you tell me that "social media doesn't work". Or you tell me that you have an app that generates $225 sales a week, saying the strategy "doesn't scale". The real issue, of course, isn't social media or apps or whatever the fancy, shiny new tool is. The real issue is "whether Jennifer will budge or not"? Remember, I like to think of our ecosystem as a mix of three customers. Judy, the 50-64 rural catalog shopping veteran. Jennifer, the 35-49 year old online maven who hunts for the best deals. Jasmine, the 18-34 year old social shopper who knows that information will "find her". So, if you want fancy new channels to work, you really have two choices. Recruit Jasmine, in large numbers. Convince Jennifer to become Jasmine. You're not going to move Judy into Jasmine territory ... at least not fast enough to matter. Too often, we try to convince Jennifer to become Jasmine. Too often, Jennifer doesn't want to become Jasmine, she wants to be Jennifer! 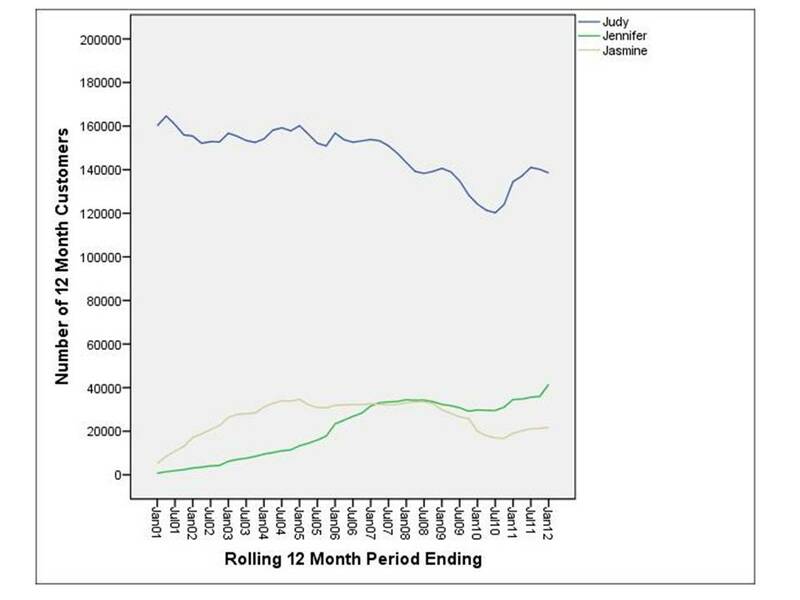 Once you code Judy, Jennifer, and Jasmine in the database, measure (or, as they say on Twitter, #measure) the percentage of each audience that switches in the next twelve months. Look at Jennifer. Jennifer doesn't want to become Jasmine, heck, she'd rather become Judy! Look at Jasmine. Jasmine doesn't even want to be Jasmine, she's more likely to become Jennifer next year. Customers are willing to try new channels, but sometimes they have a gravity for "moving backwards" to existing channels. This was very common in the 1995 - 2003 timeframe, when customers tried the online channel thanks to a whopping 30% off plus free shipping incentive, then back-tracked to old-school shopping for a period of time. I see this trend, over and over and over again. When you see this trend, it means you have a customer base that does not want to change, they don't want your brand to innovate. Your customers want things as they always have been. There are a lot of smart people out there who tell you that you must move into new channels ... or risk becoming obsolete. It's good advice, until you actually measure customer behavior. In this example, we demonstrated that customers do not want to change. When your customer doesn't want to change, you have a whole different set of strategic options to consider. You'll know what your strategic options are when you code Judy, Jennifer, and Jasmine in your customer data warehouse and web analytics solution. Get busy doing this!! 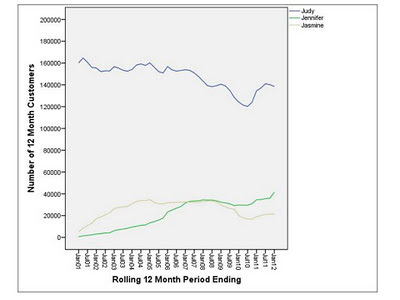 We don't often think about the profit models surrounding Judy, Jennifer, and Jasmine, do we? We monetize Judy by "front-loading" her experience. We spend money, up-front, with the hope that Judy will pay us back. We rent Judy from the co-ops. We advertise to Judy on television. We spend money, under the assumption that Judy will pay us. We spend $10,000,000 up-front, hoping to get $50,000,000 in sales and $5,000,000 in Earnings Before Taxes. We monetize Jennifer by "intercepting" her while she hunts. We do this in many ways ... by sending her three email campaigns per week (low cost) ... by intercepting her while she comparison shops on Google (only paying for clicks) ... then by teasing her (free shipping + 20% off) to close the deal. We spend money at the time of the transaction. Between Google, Email marketing, and discounts/promotions, we spend $10,000,000 to generate $50,000,000 in sales and $5,000,000 in Earnings Before Taxes. We monetize Jasmine via a hybrid of "gamification and freemium" strategies. We use Facebook and Twitter to "engage" Jasmine, we use Email marketing to build a prospect list of a half-million folks who behave like Jasmine. Then, we offer Jasmine low prices with free shipping, the offer/merchandise is so compelling that Jasmine does the marketing for the business, earning recognition-based rewards in the process. A Jasmine-based business gives up $10,000,000 of gross margin / shipping income to generate $50,000,000 in sales and $5,000,000 in Earnings Before Taxes. We get in trouble when we attempt to fuse all three strategies upon a customer, without knowing who the customer is. Sit down with your Executive Team this morning, and discuss each strategy for growing a business. Then discuss the mix of Judy, Jennifer, and Jasmine in your business. Are your strategies aligned with your customer base? Brand marketers love Jasmine. Advertisers love Jasmine. They'll pay a premium to advertise on television shows frequented by 18-34 year olds. She's the mobile/social/local guru that the pundits can't stop talking about. If you're a catalog marketer, however, you want to steer clear of Jasmine. Jasmine isn't going to call Cuddledown of Maine to place an order. And if she buys from Cuddledown of Maine, it isn't because she was mailed a catalog, it was because she has a need or because her friends told her to. As she always says, "If I need to know something, the information will find me". When you mail Jasmine a catalog, it looks like the catalog mailing is profitable. But, it is not profitable. In this example, only $0.69 of the $4.60 she spent online was "caused" by catalog mailings. Again, the key word here is "caused". Just because you mailed a catalog to Jasmine doesn't mean that it "caused" her to purchase. You can easily verify this through mail/holdout testing to a segment of customers like Jasmine. Jasmine warrants maybe one catalog a year, sometimes two catalogs a year. We over-mail the living daylights out of people like Jasmine. We'd be better served by investing the resources sending catalogs to Jasmine in business models and merchandise congruent with the way that Jasmine lives. 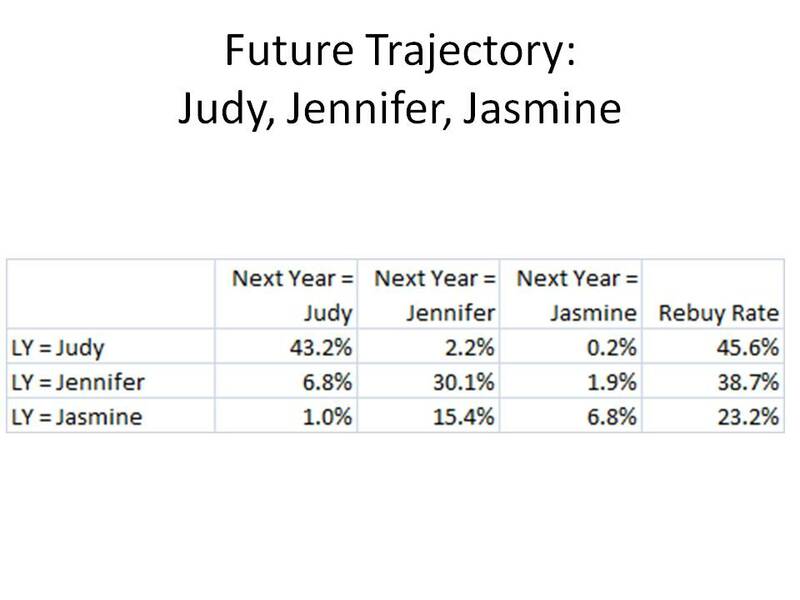 Want your own custom Judy / Jennifer / Jasmine segmentation plan and optimal contact strategy developed? Send me and email message, and let's get busy!! We learned that sending catalogs to Judy is a good idea, and for good reason! Judy is a thirty-five year catalog purchasing veteran. Judy is always going to buy from catalogs, as long as she has the money to do so. This is a BIG issue, by the way. As best I can tell, I'm the only person in catalog marketing willing to talk about the fact that the core catalog customer (Judy) is now 55+, and in many cases has begun to enter retirement. For now, we can count on Judy to pay the bills. We can count on Jennifer (the Transitional customer) to pay the bills in the future. But she won't pay them the way we want for her to pay them. Jennifer shops for the best deal she can find. She takes initiative, "searching" for the businesses and products that best align with her needs. Catalogs may be a source of inspiration, but they aren't a direct source of profit. This profit and loss statement looks different than what Judy produces. Notice that Jennifer is unlikely to shop via phone/mail. She spends her money online. Her value, as a customer, is equal to Judy. But, and this is a big BUT ... Jennifer buys regardless whether you mail her a catalog or not. Look at the 3-week online column, then look at the catalog caused online column. Of the $4.25 she spent online, only $0.98 was "caused" by catalog mailings. Your database provider sometimes incorrectly allocates the $4.25 she spent online entirely to the catalog. When you execute mail/holdout tests, you find that Jennifer is brand loyal, not catalog loyal. And this is important, because it means that, on an annual basis, you only have to send Jennifer 3-6 catalogs a year, not the 22 catalogs a year you are currently sending her. Pocket the ad cost, pocket the profit, or re-invest it in customer acquisition if you like, but don't waste it on Jennifer!! 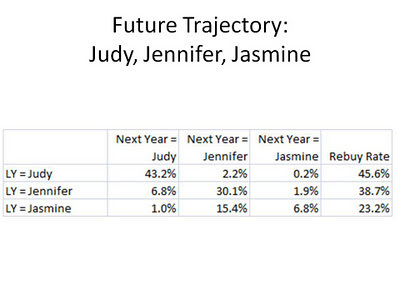 Want your own custom Judy / Jennifer / Jasmine segmentation plan and optimal contact strategy? Email me by clicking here! Judy (pictured here), the 50-64 year old catalog-centric customer who enjoys catalogs more than just about any other form of marketing. Jennifer, the 35-49 year old online maven, one who may shop from catalogs, in fact, she may do just about anything/everything! Jennifer, however, doesn't need 22 catalog mailings a year to make a decision ... she's the "decider", and because of this, you can save a lot of money by mailing fewer catalogs to Jennifer. Jasmine, the 18-34 year old master of social commerce thinks catalogs are old-school. As Jasmine likes to say, "if it is important, it will find me". You're not likely to make a dent sending catalogs to Jasmine. 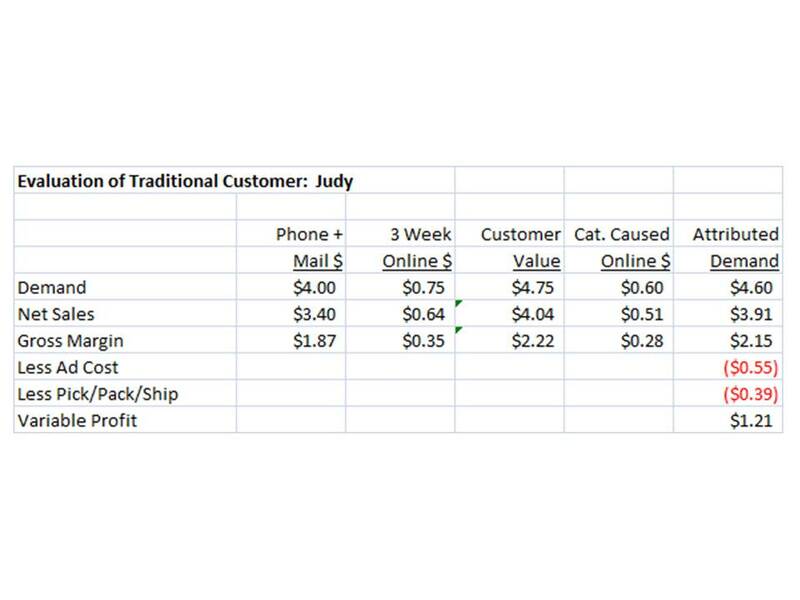 Let's see what a typical catalog profit and loss statement looks like for Judy, the die-hard catalog shopper. Judy tends to shop catalogs, then she picks up the phone and speaks to a customer service agent in your call center. As a result, her sales are highly "trackable". Judy doesn't shop online much, and if she does shop online, most of her online sales are caused by catalog marketing. Judy tends to be a very profitable catalog customer. Segment folks like Judy in your database, or give me a holler and I'll do it for you! By now, you've probably had the opportunity to read this article about layoffs at Gilt Groupe (click here for the article). Gilt is the quintessential "Jasmine" brand (click here to see the demographic composition of the website). It is heavily skewed to the 18-34 audience, with some crossover into the younger "Jennifer" demographic. The article talks about all of the discounting/full-price issues that everybody is forced to think about. The article does not talk about the core customer. In fact, these articles almost never talk about the core customer, focusing instead on channels and tactics that are the outcome of a relationship with the core customer. Jasmine, of course, is loyal to "brands" ... but Jasmine is more loyal to price. She can't afford what Jennifer can afford. When Jasmine is given a lot of choices, Jasmine will spread her dollars out across choices. This can only hurt a business like Gilt. One can imagine the Powerpoints with lofty sales growth expectations, forecast not built on actual customer behavior. If you were an Executive at Gilt, how would you have forecast sales growth over the next five years? Describe the methodology you would have used to avoid over-forecasting the future of the business. 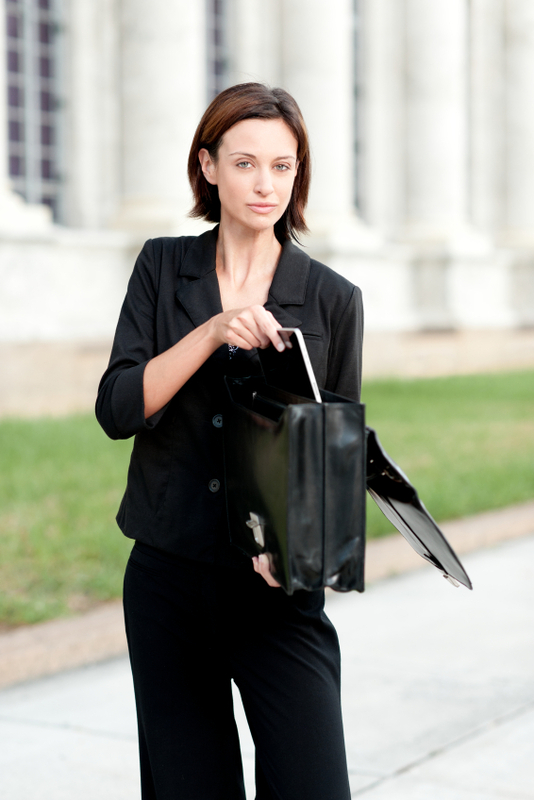 How would you have protected the business from having to lay off employees? Describe the marketing strategy that converts Jasmine from discount/promotion purchases to full price purchases. Under what circumstances can you convince Jasmine to pay more, given you've invested considerable marketing effort in encouraging Jasmine to spend less, historically? Is there a business model that might appeal to Jennifer, or Judy, and if so, how would you convince Management of the opportunity? What role does social media and mobile play in a low price point business vs. a high price point business?